Scrapbookers love Freebies. True? True. So word of a new Scrapbook Freebie site should be welcome news to many readers. About a month ago Andrea from Love, Laugh & Learn – Ingredients for a Great Life thought she would try designing some flourish brushes. They turned out so well that she decided to offer them as a freebie to readers of her blog. Then she decided to try designing some other embellishments which also were very successful. So she created some complementary papers and before she knew it she had a full scrapbook kit Tailored Flourish, which she offered as a free download from her blog. 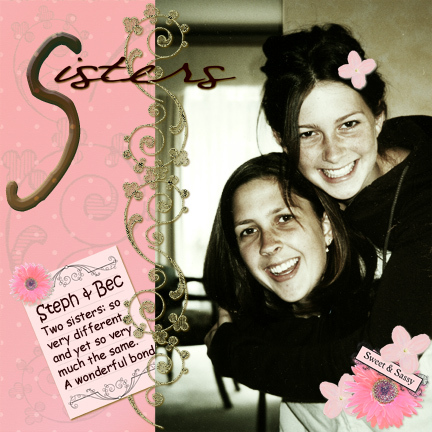 My layout of my two nieces on the left is created using the Tailored Flourish kit (I have blended a couple of the papers together to make the background). So as you can see it’s a lovely scrapbook kit. Anyway over the last month Andrea has built up quite a head of steam. And as of the date of this post, she has three freebie scrapbook kits on offer to visitors to her blog. And by the looks of things she doesn’t appear to have any plans to stop creating them. So if you like the look of Tailored Flourish, I recommend you jump on the link in this post and check out her blog. All I would ask is that you don’t forget to post a comment if you download a freebie. Remember designers like Andrea are not getting paid for all their effort in producing these fine products. Your thanks is their payment. Please don’t short change them. And paper scrapbookers don’t feel you’re not a part of this. Don’t forget you can print out the elements and digi-papers and use them on your traditional layouts. Remember the usual copywrite terms apply: don’t use or modify this material for any commercial purpose and don’t share the files or printouts with other people. Addendum: Andrea is having to free up some space on her blog, so the Tailored Flourish Kit will only be available until 24th May 2007. Get in quick if you haven’t picked it up yet. She still has other kits available though. I have just spent this afternoon over at Bonnie van Esch’s blog, Scrapping till the cows come home, downloading her back catalog of wonderful freebies. I strongly recommend that you visit her site and check it out for yourself. Bonnie is a very sweet and talented lady who designs some lovely kits and makes them available on her site for FREE! I especially like her hand painted background papers and elements which are absolutely beautiful and have a very different feel to purely digitally designed papers. Just recently Bonnie has republished all her ‘old’ freebies and made them available to visitors to her site. This is sensational from my point of view as I only discovered her a few months ago and I can now collect all her previous work. The layout below was created using her Enchanted Garden kit which, as you can see, is just beautiful. Please don’t share the direct links to the downloads with other people. Give them Bonnie’s URL and let them visit her site. And if you do take advantage of her freebies, please remember to leave a little note of acknowledgement in her comments. It’s a small price for her generosity. ADDENDUM: A couple of weeks after I posted this article Bonnie revamped her site. Great look. She also found a commercial outlet for her designs (Yay Bonnie). So she no longer offers her 300dpi designs as freebies on her site. But her kits that were designed in 200dpi are still available as freebies and well worth downloading.